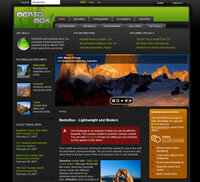 RocketTheme have launched BentoBox as the March theme for club members. BentoBox comes with thee light and three dark styles. Although structurally the same, these two theme bases create very different designs and allow for an extremely varied array of uses. Also, BentoBox uses a variation of a new CSS technique to provide a completely tableless design with a minimum of CSS hacks while still retaining module collapsing capabilities. Other great features include three built-in menu variations: SplitMenu2, SplitMenu, and Suckerfish, as well as an option to use a module in place of the built-in menus. Twelve module positions, four module style variations, accessibility options to choose font sizes, Ability to configure as Fluid or Fixed-width, the list goes on and on! You've got to visit RocketTheme for more information.